The following flyers and information were produced in July 2011. 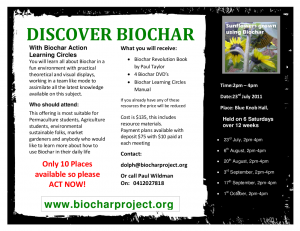 Stick around for upcoming Biochar events in 2012! Today we introduce Biochar as a serious option for carbon sequestration in Australia. Action Learning Circles for Transforming Agriculatuer and Evnrionment through the production, distribution and use of Biochar. What does the Learning Circle kit include? We welcome and encourage participation in our offering, and through the Learning Circles process you can interface the text and the field and help yourself as well as friends and family learn while having some fun and getting your hands black!! With the learning circles you can gain from interactions with others working on the same project, facilitation assistance and of course mentoring from both Paul’s both electronically and face to face. This is a great opportunity to help us co-author. Learning Circles are very well known in Europe and now more widely in Australia as a vital part of Adult Learning and Community Education. With the project at the Biochar Education Facility you can get a ‘hands on’ experience of making a retort and use this to make your own Biochar. With the book you get a substantial discount for the critically acclaimed basic reference text that is now selling widely across the world. So won’t you please join us now in working with Biochar to help make a better world for our children? They deserve nothing less.